School starts back this week for my nieces which seems super early. I mean I’m just now getting used to it being summer, and haven’t even taken any time off yet. And now it’s the season’s signal that summer is almost over. Bummer. 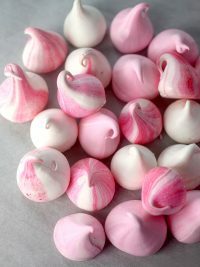 But I thought I would make some cheerful Back to School sweets for the occasion. And also because for some strange reason I can’t get the song Back to School Again from Grease 2 out of my head. Maybe I shouldn’t admit that. I’m probably one of the few that’s seen the movie more than once. On purpose. I especially like when Michelle Pfeiffer sings Cool Rider. Cooo-ooo-ooo-ool Rider. Raise your hand if you like it, too. How many of you hear crickets right now and have no idea what I’m talking about. That’s okay. 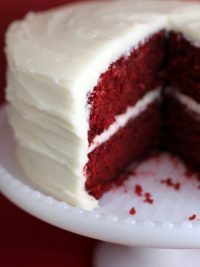 I’ll stop and talk about cake. I made some Push Up Pops.  They’ve been on my list since my friend Courtney’s book, Push Up Pops came out. I bought a bunch of these containers and they’ve just been sitting in a box waiting to be used… until this weekend when I thought they’d make a cute shape for pencils. 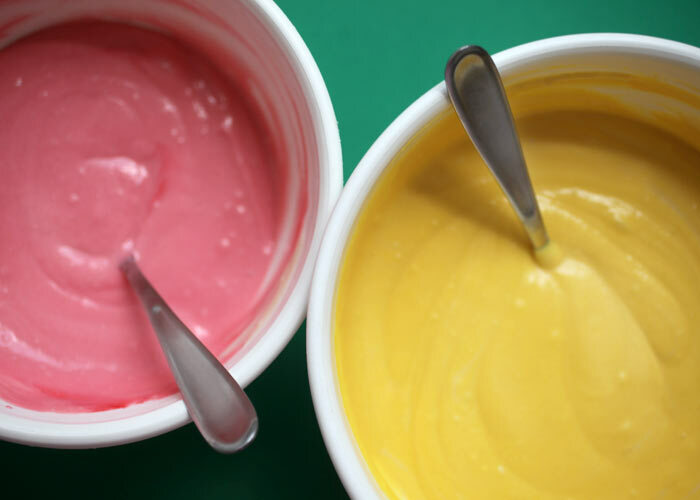 To start, just tint cake batter pink and yellow. 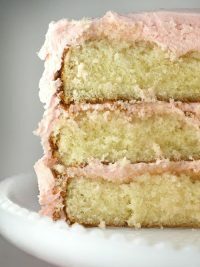 I used this vanilla cake recipe and divided the batter to tint 1/3 of it with pink food coloring and 2/3 of the batter with yellow food coloring. Then I poured it in two greased and floured baking pans. If you don’t have a 6 X 8, just use something close or even a round cake pan. 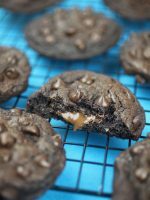 Bake them for about 18 minutes or until done. 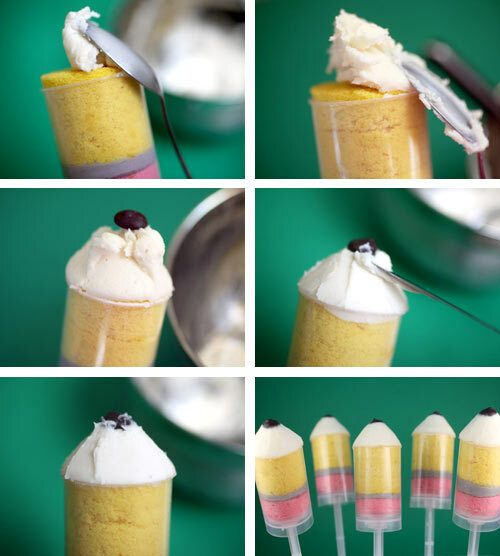 When the cake is baked and cooled, you can use the push up pop containers to cut out your cake. Cut the pink first for erasers. 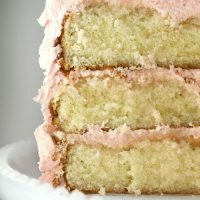 Then you can pipe some tinted gray frosting on the yellow cake layer and place your container right on top to cut it out. As you press them together the frosting will flatten out in between. Then press another yellow layer into the container or continue until the container is filled to the edge with cake. This method worked fine, but some of the browned edges of the bottom of the cakes were showing through the containers making it look like I had horizontal lines in my pencils. So I added an extra step to get rid of them. I used a small round cutter the same size as the opening of the container and cut out individual circles first. Then, I used a knife to shave the thin layer of browned cake from the bottom of the layers. 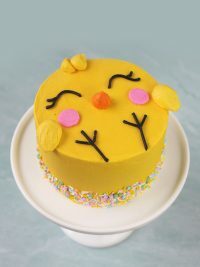 This worked great and made the yellow cake layers look a lot more seamless. 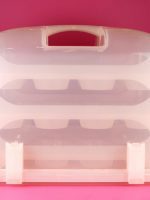 To assemble, press the pink layer in the bottom of the container and pipe some of the gray frosting in the center. Then press the two yellow layers on top one at a time. Now for the pencil tips. You just need frosting and chocolate chips. I used Ghiradelli chips because they are wide and flat and were a good proportion for my short little pencils. Apply the frosting with a spoon and pull down against the edge of the container. Repeat until all sides are covered and you have the beginnings of a pointed shape. Then place a chocolate chip on top and with a sharp non-serrated knife, smooth out the frosting. Allow some of the frosting to overlap the bottom of the chip so it appears flush. Once you get a pretty good shape going, just place the container in the freezer a few minutes for the frosting to firm up a bit. Then it will be easier to shape. You can also run your knife under warm water, wipe it off and use it to aid in smoothing the surface. 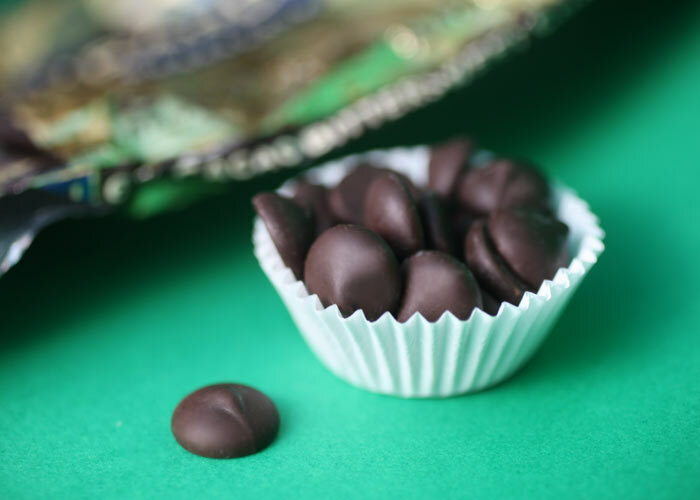 Once shaped, wipe any frosting off the tip of the chip with a dot of water. Make the vanilla cake batter. Divide batter so you have 1/3 in one bowl and 2/3 in another. Tint 1/3 of the batter with pink food coloring or a few drops of red. Tint the other bowl of batter yellow. Add drops of color until you get a shade you like. 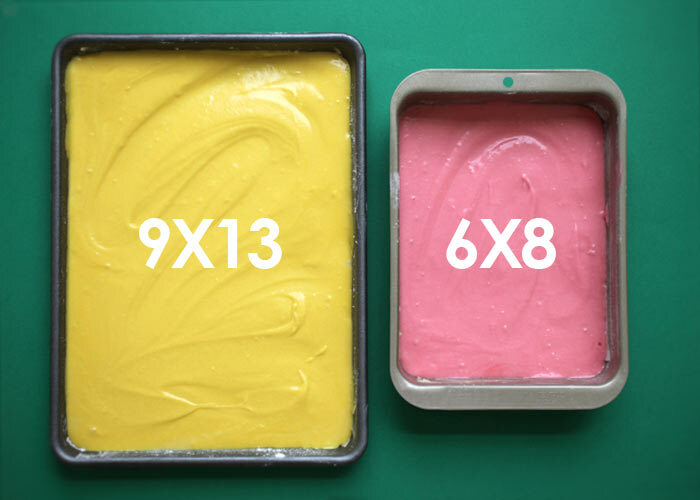 Pour the yellow batter into a 9X13 baking sheet or pan and the pink batter into a 6X8 or similar size pan. Bake for about 18 minutes at 350 degrees. Let cool. 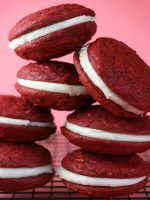 Make frosting and tint 1/4 with a few drops black food coloring reserving the rest. Start with a drop at a time until you achieve gray. Place gray frosting in a ziploc bag and cut the tip off one end so you can use it to pipe the frosting. 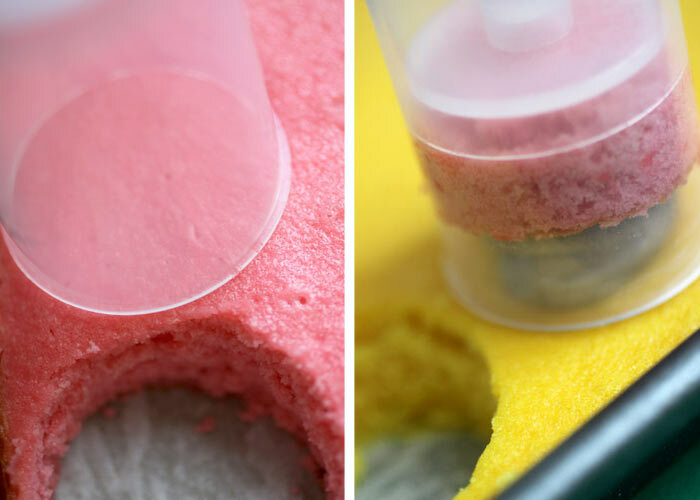 Use the Push Up Pop container to cut out a pink cake circle. Add frosting on top of the yellow layer and place container on top of the frosting. Press container into the cake so that the two layers sandwich the frosting. Add another layer of yellow cake. If your cake has brown edges, use a cookie cutter to cut the circles first and then gently saw off the brown edges with a knife. 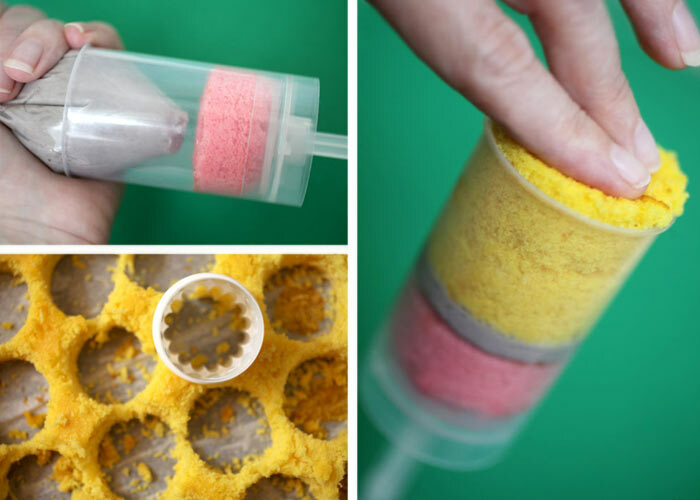 Place the pink circle in the push up pop container and then pipe the frosting on. Then place two yellow cake layers on top or enough until the cake meets the top edge of the container. Use the reserved untinted frosting to form a mounded triangle on top of the container. Add a chocolate chip and use a knife to smooth out the frosting like illustrated above. 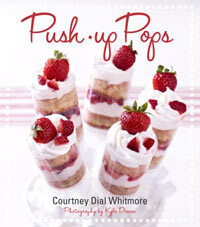 And check out my friend Courtney’s book for lots of fun Push Up Pop Recipes. AWESOME. Having one of these in my lunch box would definitely make the school days more bearable! 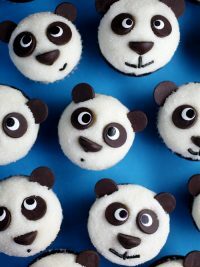 These are adorable to the max! I will most definitely be making these for my students–erm, in-the-far-future students. 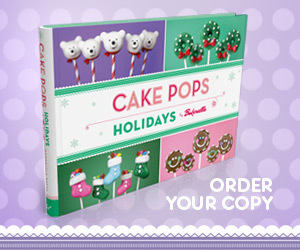 Also, I was at the Hollywood Bowl store on Friday for Pixar in Concert and came across your cake pops book–it’s so great seeing your work pop up in just the most random places! Thanks for sharing! Not only do I see your love of Grease 2, but I’ll raise you with me lovin’ Maxwell Caulfield in Dynasty and The Colbys…I’ve dated us both haven’t I?? The pops are adorable! I bet the kids love these. I know mine would have when they were in school. Cutest things EVER! Although my kids are going into their second week of school over here in Hawaii! Way too early! I had to giggle at the start of your post – I love that movie – I even tried to tape the songs (yes on cassette tape!) straight from the tv!! Makes me want to go and watch it now – and now I have coo-oo-ool rider in my head…. 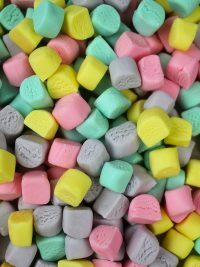 These are awesome for kids snacks!! These are adorable! 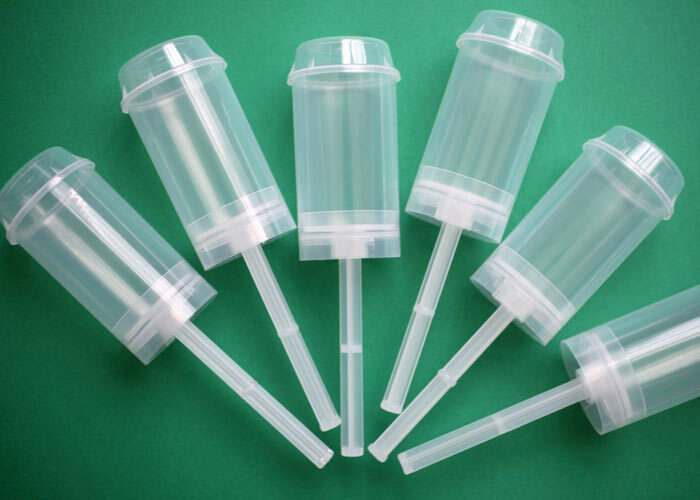 I’ve been thinking of getting these containers myself…might just have to place the order. What a unique back to school treat. Good motivation for having to go back so early! I love these! Soooo fun! You are seriously the best. Awesome idea! 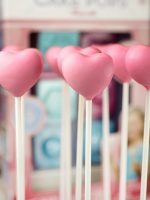 Gorgeous cake pops – but love the movie too! Have seen it sooooo many times, now have cool rider stuck in my head and i love it! These are about the cutest push pops in the world!! I love Grease 2! 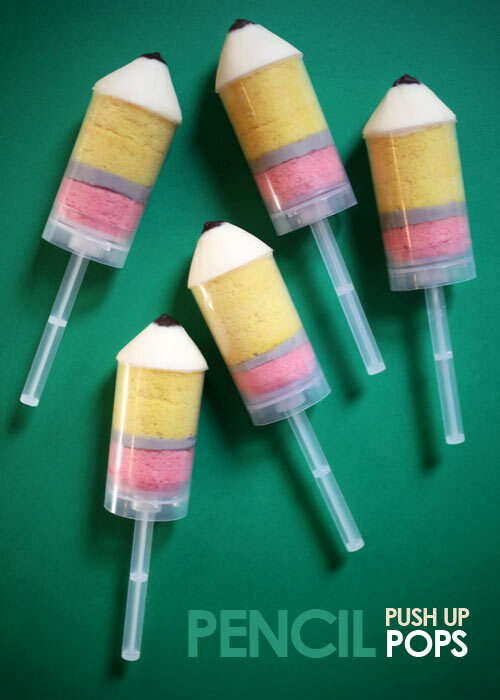 And these pencil pops…. Wow! These are ridiculously cute and just perfect for back-to-school. 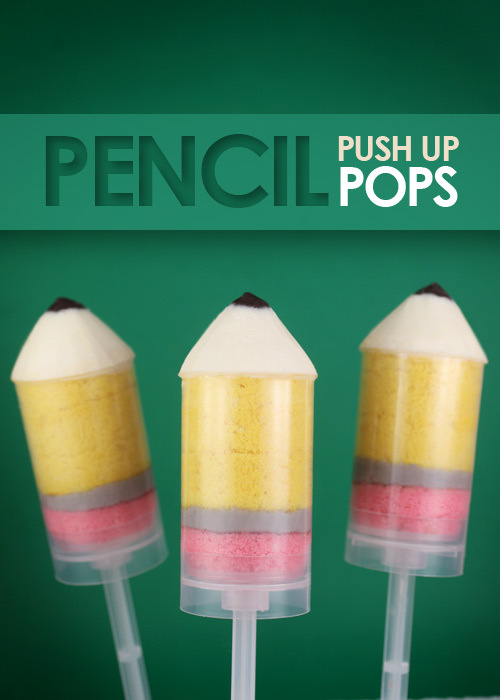 Ive been wanting to try pushup pops for a while too so I will have to check out Courtney’s book. One thing I have been wondering is how easy are they to eat? Do they get messy? Those are too precious! Where can you get them? 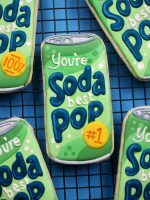 I’m a school librarian and would love to make those for my co-workers!! As a teacher, those are so cute!!!! Adorable! What a perfect gift idea for welcome back to school! 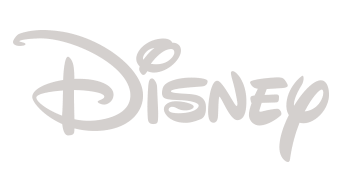 … Cool Rider is one of my favorite songs from that movie too! So completely adorabe! Another hit, Angie! Adorable and so perfect for back to school! Love it! Adorable and amazing at the same time! I’m constantly amazed by your creativity, Angie! I love Grease 2, too! My sisters and I spent a summer watching it at least once a day (on VHS) and we learned the dance steps in all of the production numbers! Ah, sweet memories – I really need to get G2 on DVD! These are so cute! I feel like if I tried to make them, they’d look and taste horrible though, so I will just admire. And yeah, that does seem early for back to school! Weird. 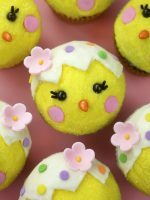 These look really cute, but I wonder if it is as yummy to eat because they will eat all the icing at the top then not have any to eat with the cake parts. I love icing so I’d want more icing yum yum. Pretty colors though. I love these! So unique and a great treat for the kids. ;) My son will love these! Really? What can’t you do! By now I guess we shouldn’t be surprised. Yet you continue to amaze. GREAT job! Love them! You always come up with some of the best ideas when I’m thursting for them. Good thing you give me inspiration! SO cute and just in time for back to school! That is so clever…love them!  Terrific idea! These can make great gifts for Teachers/Staff Appreciation week with a ribbon and personalized card! LOVE Grease 2!!!! Now the songs are stuck in my head. Of course, my favorite was “Let’s Bowl”. Thanks for the memories! Love that movie. Own the Soundtrack on CD, and than you SO MUCH for showing me how to get hte cake into the push up tube!! These are the cutest things that I’ve ever seen. 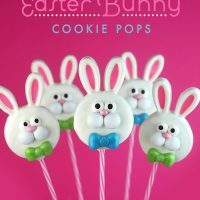 I can’t wait to make some of these this year. Reproduction…where does the pollen go?! Reproduction….reproduction! I looooove Grease 2! I have fond memories of singing the songs with my husband’s roommate (from before we were married). We were big fans. 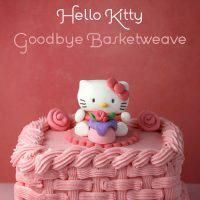 Hey Bakerella! I’m a huge fan, you are so unbelievably creative. 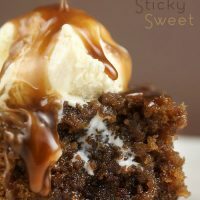 I was wondering, have you considered baking with oats and Stevia for those who cannot have sugar? Those are darling and you, my dear, are a complete perfectionist. These are adorable! My nephew is about the start Kindergarten and would love these! Adorable and Hysterical post! I LOVE Grease 2!! I just watched Grease 2 on Saturday. My daughter’s 11 year old friend was over and said, “I love Grease..it’s my favorite old person’s movie!” I kicked her out of the house shortly after. I’ll be yours in Springtime, when the flowers are in bloo-hoom. oh, stop! These are FANTASTIC!! I actually used a recipe from your blog for red velvet cake pops, and made them orange! Everyone loved them , like one comment, “Which bakery did you buy these from?” Also, I am only 13 year old boy, which makes this a fun recipe for all ages! Absolutely adorable as always! I am so excited that my local cake supply store is now carrying the push pop holders! haahaa, I have never met anyone who has seen that. . .made my hubby watch it with me, he thinks I”m nuts! The song started playing in my head as soon as you said that. Oh, and my kids would flip for these!! “Let’s do it for our country! 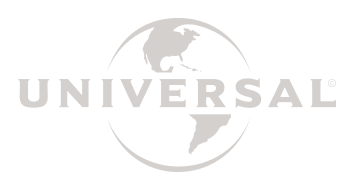 Our country wants us to!” There’s a Grease sing -a-long movie event, why not Grease 2? I will say..I have NEVER seen Grease 2, but am a huuuuge fan of the original. Second, I know every word to that song and am now singing it LOUD! Love that you’re singing it too! As always, so fabulous! Thanks for sharing! These are all kinds of adorable. You amaze me! 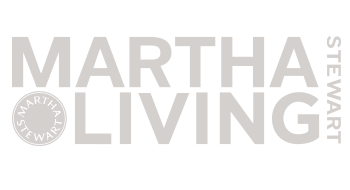 I love your blog and all you creations. Lovely! :D Thanks for all the inspiration. so cute, I have been dying to try those push pops, but the containers are costly here. My kids think I am crazy because I will actually get up and sing all the words to every song in Grease 2. LOVE IT! These are adorable, Angie! Wouldn’t these be adorable for the first day of school? Too cute! Those are way too cute! I love them!!! You really have a gift. This is so creative. As a teacher these are absolutely brilliant! Thank you for sharing!! I LOVE Grease2. Seriously I must have watched it dozens of times. I even wanted to do a whole talent show in school to do the Girl for All Seasons! Oh, and the pushup pops are cute too ;-) Would be adorable for a kindergarten teacher to make up for kids true first day of school.ever. Super creative! And I can’t believe they are going back to school already. It does seem way too early! How amazing is that ? I love this idea! You always give great ideas and you are so inspirational!!! THANK YOU BAKERELLA!!!! Ridiculously adorable. You are amazing! Now that’s some cute $h!t right there… Super cute. I may have to buy that book. Where do you get the pushups?